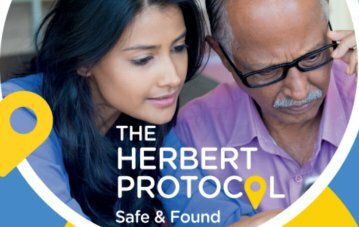 The Herbert Protocol is a national scheme that aims to help keep people with dementia safe. It has recently been introduced by Derbyshire Constabulary and other local agencies. The protocol encourages carers of people with dementia or other mental vulnerabilities to prepare for the eventuality of the person going missing. Carers are asked to complete the Herbert Protocol form which asks for the type of information the police need to know when they start to look for a missing person who is vulnerable. In the event of an emergency, the carers can send/give the ready completed form to the police to reduce the time it usually takes the police to gather this kind of information. The form records all vital details, such as what medication the person requires, mobile numbers of emergency contacts, previous addresses or important locations they may try and go back to and any other information which will help locate the person if they ever go missing. A recent photograph of the person should also be kept with the form. Carers and family members are encouraged to complete the Herbert Protocol form in advance, ideally in addition to other carer emergency plans. You can find out more about the Herbert Protocol on the Derbyshire Constabularly website where you will also find more guidance on how to use the form.